FASTNET ROCK (AUS) (Bay 2001-Stud 2005). 6 wins to 1200m, VRC Lightning S., Gr.1. Champion Aust. Sire twice. Sire of 959 rnrs, 647 wnrs, 80 SW, inc. Super Cool (VRC Australian Cup, Gr.1), Atlantic Jewel, Sea Siren, Planet Rock, Mosheen, Driefontein, First Seal, Atlante, Foxwedge, Lone Rock, Diamondsandrubies, Qualify, Amicus, Magicool, Nechita, Rock 'n' Pop, Irish Lights, Wanted, Albany Reunion, Your Song, Rock Classic, Smart Missile, Lumosty, etc. Remerged (f. by Sebring). Winner at 1300m in 2014-15, 2d MRC The Cove Hotel H.
Lucky Deja Vu (g. by Redoute's Choice). 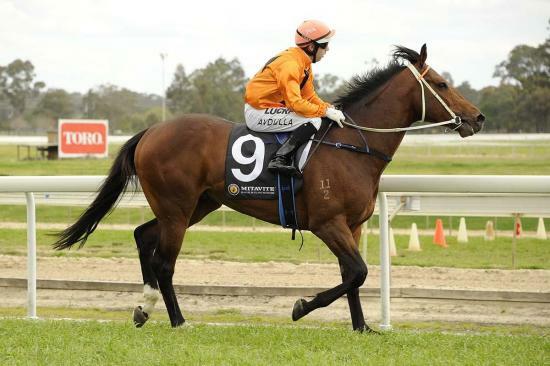 2 wins at 1200m, 1300m to 2014-15 in Aust. Anadan (f. by Anabaa). Winner at 1600m in Aust. Trader (Dehere). 3 wins to 1500m, A$181,725, STC Top Cut Steaks H., Theslipper.com.au H., 2d MVRC Crystal Mile H., Gr.2, STC Premiere S., Gr.2. MAJESTICALLY (Maroof). 10 wins-2 at 2-from 1100m to 2400m, A$677,593, AJC Summer Cup, Gr.3, STC Stayers' Cup, L, Frank Underwood Cup, L, Lord Mayor's Cup, L, AJC De Bortoli Wines H., STC Star City Welter H., Illawarra TC Kembla Grange Cup, AJC Hershey's Cookies 'n' Creme P., STC Romeo Cellars Smithfield H., Wong 2YO H., 2d STC Todman Slipper Trial S., Gr.2, NE Manion Cup, Gr.3, Clarence River JC Grafton Cup, Gr.3, AJC Australia Day Cup, L, STC Stayers' Cup, L, WJ McKell Cup, L-twice, Christmas Cup, L, Murrumbidgee TC Wagga Gold Cup, L, 3d STC Winter Cup, L, 4th AJC Summer Cup, Gr.3, STC NE Manion Cup, Gr.3, AJC Australia Day Cup, L.
Rose Darmore (More Than Ready). Winner at 1200m, SAJC Irish Day August 22nd H., 2d SAJC Fulham Park 2YO P., Dermody BP Athol Park 2YO H., 3d MRC Blue Diamond Prelude (f), Gr.3, SAJC Laelia S., L, 4th SAJC Dequetteville S., L. Producer. Woodala (Woodman). 6 wins from 1400m to 2400m, A$186,800, Northam Cup, WATC Astralander H., Bold Conqueror H., Quanah Park Afleetaffair H., 2d WATC Ascot Gold Cup, L, 3d WATC Baileys Mint Chocolate H., D'Orsogna Italian Festival Trophy H., AJC Chris Lean H., WATC Petola H., 4th WATC Farnley S., L. Producer.